Bose's premium wireless noise-canceling headphones, the QuietComfort 35 II are once again on sale for $85 off. From what we've been able to track to date, this is the best deal on Bose's QuietComfort, so if by any chance you're waiting for a great price on these headphones, now would be a good time to ready your wallet. 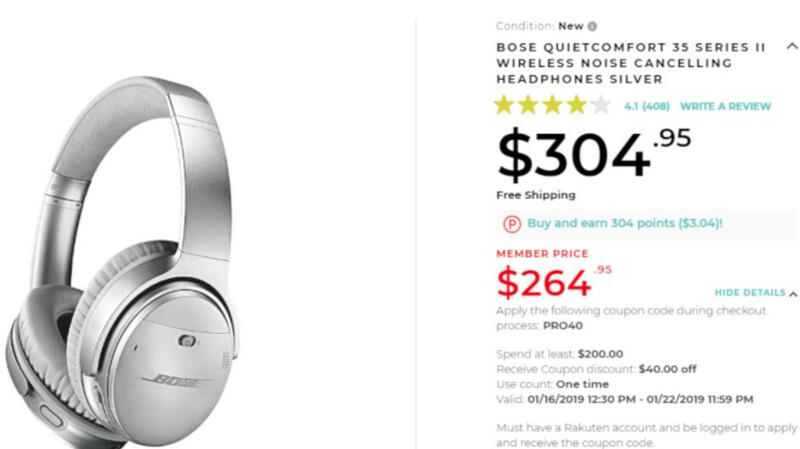 For a limited time or while supplies last, ProElectronics offers the Bose QuietComfort 35 II wireless noise-canceling headphones for just $265 via Rakuten. Considering these usually sell for $350, you'll be saving $85 if you take advantage of the deal. However, there are a couple of things you should know before trying to buy Bose's excellent headphones. First off, you'll need a Rakuten account to benefit from the deal. Secondly, you'll have to apply the PRO40 coupon code during the checkout process to lower the price by an additional $40. Otherwise, the headphones are available on Rakuten for $305, not that good of a deal. In both cases, customers who buy the Bose QuietComfort 35 II headphones will get free shipping in the United States.